The book is split into nine parts, including a conclusion with extra resources and bibliography. In the first part, the authors write about the similarities and differences between the ancient holidays situated in February — turns out Imbolc is a strange mixture of Celtic, Roman, and Christian traditions — and even briefly mention a few holidays not from Europe, such as Setbun, the Japanese Bean Throwing and Lantern Festival; Li Chum, the Chinese Spring Festival; and Holi, the Hindu Festival of Colour. The second chapter focuses on Brighid herself — as a goddess, a saint, and woman of legend. So little is actually known about Brighid, historically speaking, that the authors admit, “We do not know whether Brigit began as a natural force like fire, later humanized, or as human being, later deified.” While these first two chapters were the most useful to me, at least in that I had resources to find out more information if I wished, I felt put upon by some of the assumptions the authors make about the goddess Brighid, her traditions, and her holiday. Think about it for a minute: did Zeus begin as a “natural force”, later to be humanized so that we could understand him, or as a human, later deified? I don’t think it was either; Zeus is Zeus, the king of the Olympian gods. He was never an idea in the same way “glory” or “happiness” or even “fire” is an idea, and he was never human. He was and is a god. The same, I think, is true for Brighid. She was and is one of the greatest goddesses ever to walk the Earth, and just because the world doesn’t know her anymore doesn’t mean she’s suddenly only an idea or just a human of legend. Later chapters include information about the holiday’s customs, symbols, and traditions; divination, including flame scrying; cleansing and purification for the new year and the spring; examples of celebrations and rituals for Wiccans; candle-making, including an entire chart with candle colors, herbs and oils, purposes, and connected deities; and a whole set of festive food and beverage recipes. 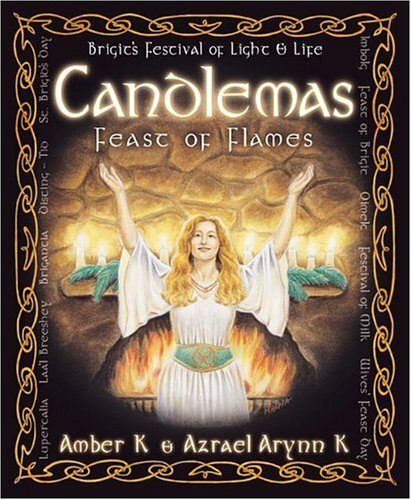 Candlemas is a decent beginner’s resource, I think, but I was disappointed by the lack of investigative research –most of the resources and bibliography are works by other modern writers — and the emphasis on Wiccan rituals without notes to allow for polytheist (or other Pagan) variations. The Wiccan concepts of “Goddess” and “God” — with specific deities only representing certain facets of a greater whole — does a disservice to those deities by lumping them into groups that they might not place themselves! As for the book: it’s a good place to start, but I don’t recommend using it as a textbook or be-all-end-all for information about Brighid or Imbolc.